IF YOU FEEL THAT YOUR DOG MAY HAVE THIS CONDITION, STOP READING AND CALL YOUR VETERINARIAN IMMEDIATELY. THIS IS A FATAL CONDITION! Bloat, also known as GDV (gastric dilation-volvulus) is a very serious condition. It can happen very quickly and is fatal if not treated. The stomach starts to fill with food, gas, air, or a combination of all three. This causes the dilation. Then the stomach twists or flips 180 to 360 degrees, cutting off the entry, the esophagus, and the exit (the duodenum). This causes even more swelling, putting pressure on the other organs. The stomach’s blood vessels are compromised, and the stomach starts to die, causing the blood supply to the rest of the body to be disrupted. There are several causes that can lead to bloating. The first and most common is breed disposition and genetics. If one of your dog’s close relatives has had bloat, your dog is at high risk. Dogs with deep chests are very prone to bloat. It is more common in males than in females, and dogs more than 7 years of age are at high risk. 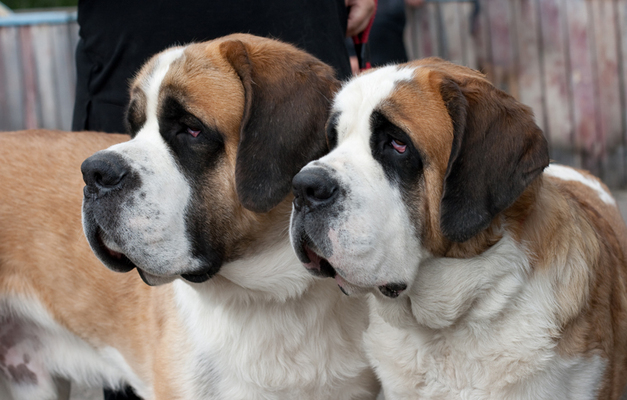 Twenty-four percent of large breeds will get bloat. High-risk dogs should be fed 2 or 3 times daily, and not from elevated dog bowls. Dogs that eat and drink fast are more likely to gulp air with their food. Try putting a tennis ball in their dishes to make them slow down. Do not allow them to have excessive exercise two hours before or two hours after eating. Dogs that easily become stressed should be fed in a quiet area. Water causes dry dog food to swell, so do the kibble test to see how much. Put a ¼ cup of dry kibble in with ¼ cup of water and let it sit overnight. If it swells too much, you might want to change dog food. If you do change food, do so gradually over 3 to 5 days. Owners who have dogs that are high-risk should know the signs of GDV. The most obvious is the swelling of the abdomen. Non-productive vomiting is the next most common sign. This is because the stomach has twisted, and the dog feels like it has to vomit, but cannot do so. Other signs are immense pain, rapid shallow breathing, restlessness, and salivation. This is followed by a weak pulse and shock as the dog becomes closer to death. A dog can go through these stages rapidly, in matter a just a couple hours. The only way to treat GDV is surgery. The veterinary team will run bloodwork, give fluids to reduce shock, and take x-rays if the dog is stable. They will also perform stomach decompression, usually by sticking a needle into the stomach to let the air out. The surgery, called gastropexy, will untwist the stomach and suture the stomach so that GDV will not reoccur. The survival rate is between 60 and 70%. After surgery, the dog needs to be monitored for at least 48 hours to make sure it is stable. Many of these dogs can have complications post-surgery, including heart arrhythmias from the shock, ulceration or perforation from the stomach twisting, and liver and pancreas damage from the swelling. When the stomach is righted, many times the gases and toxins that have been released can cause infection to occur. There is also a condition called DIC (disseminated intravascular coagulation) that can start post-surgery where small blood clots start to occur. The stomach torsion can be the start of many other problems ihat can be fatal. Always keep your emergency veterinarian’s phone number available.